Dr. Muhammad Tahir ul-Qadri (Urdu: محمد طاہر القادری) (born February 19, 1951, Jhang, Pakistan) is a Pakistani Sufi scholar and former professor of international constitutional law at the University of the Punjab. 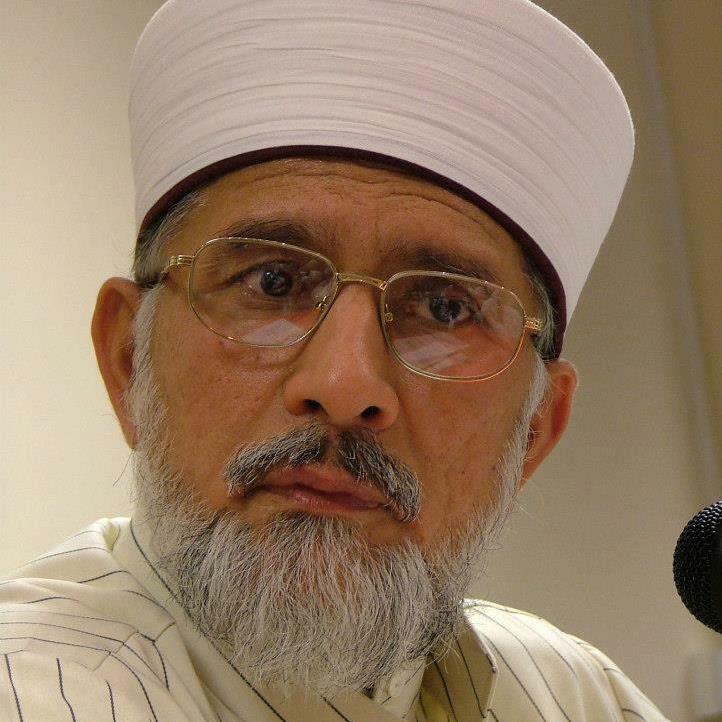 Qadri is the founder of Minhaj-ul-Quran International, a broad-based global Sufi organization working in the fields of welfare, human rights and education. Its objectives are the promotion of a moderate and non-extremist vision of Islam, the establishment of good relations and understanding between communities and religions, and the education of youth through “employing the methods of Sufism”.He also founded The Minhaj University of which he is the head of the Board of Governors, as well as an international relief charity, Minhaj Welfare Foundation. Qadri is also the founding chairman of the political party Pakistan Awami Tehreek (PAT), although he is no longer involved in politics. Qadri spoke at the World Economic Forum in January 2011. Al-Sayyid Abu al-Barakat Ahmad al-Qadri al-Alwari (d. 1978). One of the hadith narrators of the Sub-Continent, he is the son of al-Sayyid Didar ‘Ali al-Shah al-Alwari (student of al-Shaykh Ahmad ‘Ali al-Muhaddith al-Saharanpuri) and was a student of Ahmed Raza Khan Barelvi. Qadri studied under him for four years and was gifted all of the Shaykhs ijazas in Hadith and Fiqh in 1972. Ustadh al-‘Ulama’ al-‘Allama ‘Abd al-Rashid al-Ridwi (d. 2011). Qadri completed the classical Dars-e-Nizami course with him from 1963 to 1970 at Jami‘a Qutbiyya Ridwiyya, Jhang. Lessons were conducted from the predawn Tahajjud prayers at three o’clock in the early morning to eleven o’clock at night with pauses between noon and afternoon. No other student was taught while he was engaged in coaching Qadri. In 2007, he attended the birthday gathering of Qadri and whilst praising his talents and achievements, said:“Today we are lucky to be present here in connection with the birthday of a true lover of the Holy Prophet. I started teaching Shaykh-ul-Islam when he was very young but I never saw him missing his (predawn) Tahajjud (prayers). Al-Shaykh Ahmad az-Zubaydi (whose father’s standing was such that he was known as Abu Hanifa al-Saghir) of Syria who is allegedly from the family of Imam al-A`zam Abu Hanifa reports that he personally heard Tahir Allauddin al-Gilani referring to Tahir Qadri as “Mujaddid (Reviver of Islam)”.‘Umar ibn Hafiz of Hadramawt in Yemen, receiving Ijazas from Qadri. He studied law at the University of the Punjab, Lahore where he graduated with an LLB in 1974, gaining a Gold Medal for his academic performances. Following a period of legal practice as an advocate, he taught law at the University of the Punjab from 1978 to 1983 and then gained his PhD in islamic Law (Punishments in Islam, their Classification and Philosophy) from the same university in 1986. He was appointed as a professor of Law at the University of Punjab, where he taught British, US and Islamic constitutional law. Qadri was appointed as a Jurist Consultant (legal adviser) on Islamic law for the Supreme Court and the Federal Shariat Court of Pakistan and also worked as a specialist adviser on Islamic curricula for the Federal Ministry of Education (Pakistan). At various times between 1983 and 1987, he received and declined offers for various high-level posts. He has delivered more than 6,000 lectures on economy and political studies, religious philosophy, law, Sufism, medical sciences, material sciences and astronomy. Numerous lectures are available in Urdu, English and Arabic at Islamic bookshops around the world. Dr. Tahir ul Qadri has announced a long march on January 14th, 2013 against the current system asking for major reforms in the electoral system in Pakistan.